The user experience (or UX) design of a device describes how us human-folk interact and use the device. For example, pinching to zoom in on a picture is delightful and intuitive. That’s a good user experience. The user interface (or UI) design is the what the screens and buttons actually look like – the fonts, colors and graphics that you see. So before you scream about how horrible iOS 7 is, try and look past the hideous UI and try and focus on the UX improvements that will make your iDevices easier to use. 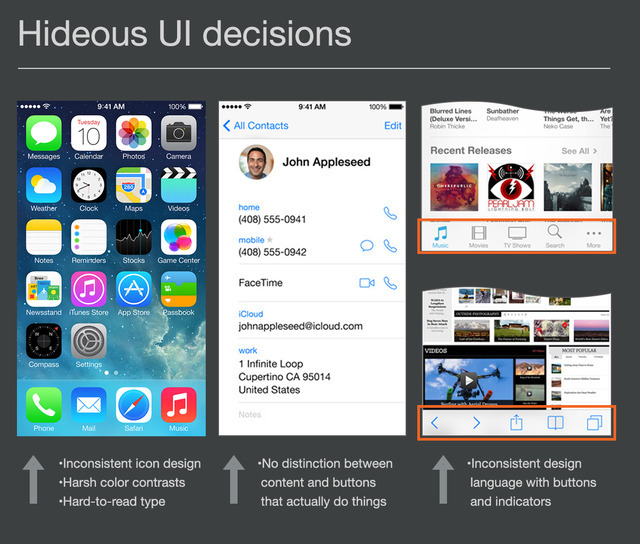 And let's all hope that Apple comes to their senses and cleans up the UI, shall we?